The "new NAFTA" pact was symbollically signed Friday at the G-20 summit. Now that President Donald Trump has symbolically signed the revised North American trade agreement at the G-20 summit in Argentina, he moves a step closer to delivering on a campaign promise -- to replace NAFTA or terminate it -- after a week fraught with negative economic headlines. Just Tuesday, General Motors announced that, in light of the new deal, it was laying off 15 percent of its workers and shuttering five plants in the U.S. and Canada. The president had boasted that the renegotiated and renamed USMCA deal -- the U.S. Mexico Canada Agreement -- would have just the opposite effect. "He believes -- as, frankly, the prime minister of Canada, Trudeau, believes -- that the USMCA deal was a great help to the automobile industry and to autoworkers," Trump's economic adviser, Larry Kudlow, said, reacting to GM's decision. (Tony Dejak/AP) A sign is displayed at General Motors Lordstown Wast plant, Nov. 27, 2018, in Lordstown, Ohio. Renegotiating NAFTA was a centerpiece of Trump's presidential campaign. Campaigning in New Hampshire in 2016 he called it "the worst trade deal ever made in the history of the world" vowing to "totally renegotiate NAFTA." After 14 months of tense negotiations and repeated threats, the president in October said: "We have kept that promise." 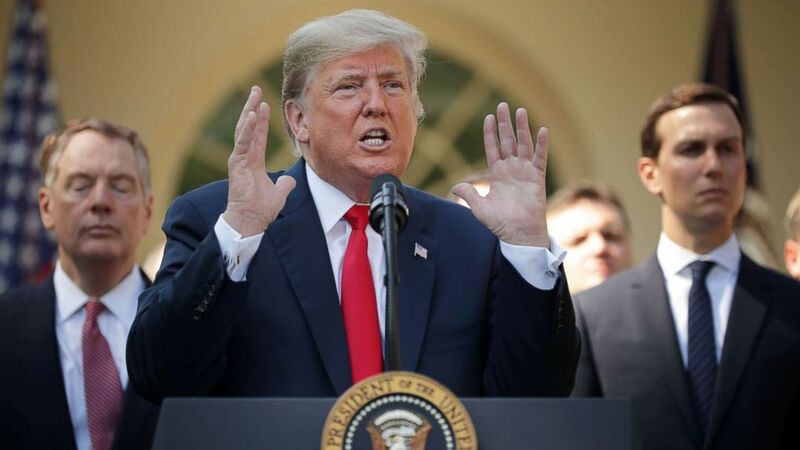 Touting the USMCA at a Rose Garden ceremony, he vowed it would be the "most modern, up-to-date and balanced trade agreement in the history of our country." "This is a much different deal than NAFTA," Trump said. "If you really believe that NAFTA was the worst trade deal in American history, you can't reconcile yourself to say that this new USMCA is a very good deal or represents a breakthrough," Hufbauer said. "It wades deep into the land of fiction." Trump has talked about the new name repeatedly. As the deal was being negotiated, he called the new name "elegant" at an Oval Office event in August -- at the time, the deal only included Mexico. "I think NAFTA has a lot of bad connotations," he said. At his October Rose Garden event he said calling it USMCA "sort of just works ... has a good ring to it." (Chip Somodevilla/Getty Images) President Donald Trump speaks during a press conference to discuss a revised U.S. trade agreement with Mexico and Canada in the Rose Garden of the White House, Oct. 1, 2018, in Washington, DC. Hufbauer said the substantive changes that do exist are consistent. "This is a tip-toe back into the realm of protectionism," Hufbauer said. "There's a big sigh of relief, not just from industry in the country, but also Canada and Mexico that it didn't go further in terms of protectionism." The Trump administration's signature changes are concentrated on the auto industry. The USMCA requires that cars and trucks have 75 percent of their parts made in North America, tightening NAFTA's "rules of origin." Under NAFTA, 62.5 percent of the parts were required to be sourced from North America. A potentially more controversial change demands that a minimum amount -- 40-45 percent -- of a car must be produced by high-wage labor, workers making the equivalent of $16 per hour. 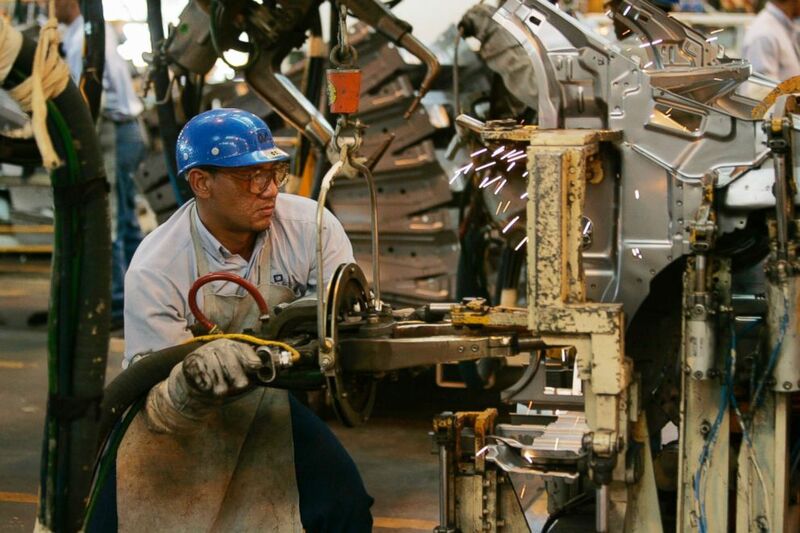 The AFL-CIO reports that the average auto worker in Mexico makes $2-$2.50 an hour. 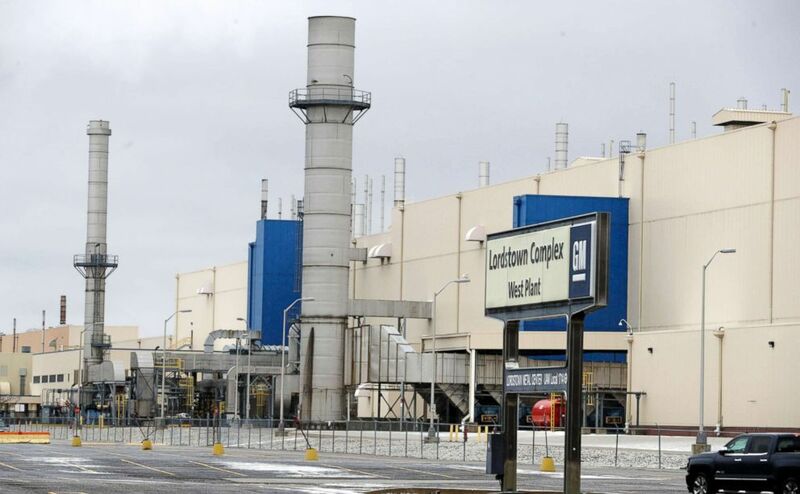 The move is meant to incentivize production in the U.S. and Canada. Some analysts have warned this could lead to higher costs. "What it spells out for consumers is that they'll be paying more. It's the opposite of what NAFTA stood for,” Edmunds analyst Ivan Drury told ABC News in October. While the imposition of new tariffs falls outside the text of the deal, it's another piece of the administration’s protectionist agenda putting pressure on the industry. General Motors has said tariffs on imported steel cost the company $1 billion. Under the deal, Canada agrees to open its dairy market, an issue Trump has stressed repeatedly, calling it a potential "deal breaker." Similar provisions were offered in the Obama-era Trans-Pacific Partnership, which Trump exited. Canadian farmers have protested the increase in quotas on U.S. products including milk, yogurt, milk powder and formula. The deal also gives U.S. exporters of chicken, eggs, turkeys and American wheat more access to the Canadian market. Going forward, the deal limits the countries from making any deal with China, and it allows any country to withdraw from the USMCA without cause by providing at least six months written notice. Finally, the entire deal "sunsets" in 16 years unless extended after a formal review. There was no such provision in the NAFTA deal. Mexico, Canada, business interests, and Republicans in Congress have opposed the concept, contending it may create uncertainty for businesses. (Jack Gruber/USA Today Network, FILE) Workers on the assembly line at the General Motors assembly plant in Valencia, Venezuela in this March 16, 2007. When Congress eventually gets to vote, the measure will be eligible for what's known as "fast track" passage. "Fast track" expedites a final up or down vote by prohibiting amendments and filibusters. But some Republicans are worried that, even with that, the process might not move quickly enough for the deal to pass before a new Congress convenes in January. "We are concerned that if the Administration waits until next year to send to Congress a draft implementing the bill, passage of the USMCA as negotiated will become significantly more difficult," a dozen Republican senators wrote in a letter to Trump. The letter is signed by GOP Sens. Pat Toomey of Pennsylvania, Lamar Alexander of Tennessee, Steve Daines of Montana, Deb Fischer of Nebraska, Jeff Flake of Arizona, Ron Johnson of Wisconsin, Jon Kyl of Arizona, James Lankford of Oklahoma, Mike Lee of Utah, Rob Portman of Ohio, Ben Sasse of Nebraska and Ted Cruz of Texas. But Toomey would like Trump to make some last-minute changes. In a Wall Street Journal op-ed the same day, the self-described free trader called it a "mixed bag of trade-enhancing and trade-restricting changes to the current North American Free Trade Agreement. He requested "pro-trade modifications," including revisiting the sunset provision and changing the wage requirements on auto and auto parts production. But Democrats and unions, including the United Auto Workers, have expressed cautious optimism about the parts of the deal aimed at protecting worker wages. In a statement, UAW President Gary Jones called them a "step in the right direction." Senate Democratic Leader Chuck Schumer said at the time the deal was announced that “the president deserves praise” for his efforts.